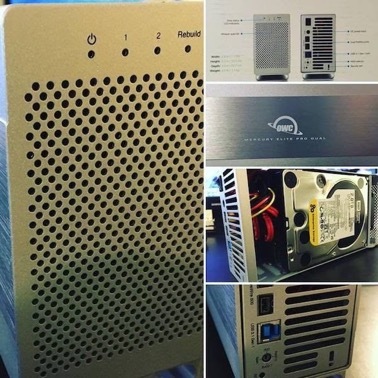 The latest addition to our server rack: OWC Mercury Elite Pro Dual drive enclosure from MacSales.com. We added 2x2TB Western Digital enterprise-level HDDs set up in a RAID 1. An awesome server storage solution or Time Machine backup, with redundancy! We chose the model with USB 3.1 Gen 1 + FireWire 800 ports for versatility with both our older and newer Macs. There are also models with eSATA and Thunderbolt 2 ports. Thunderbolt 3/USB C configurations are found on the Quad Drive models. Our unit came configured out-of-the box in high-speed RAID 0 mode for a maximum sustained throughput up to 390MB/s, fast enough for HiDef video workflows. We went with RAID 1 mode, which is not as fast but provides the extra security of mirrored data. Therefore, if one of the drives fails, we have a mirror copy on the second drive. 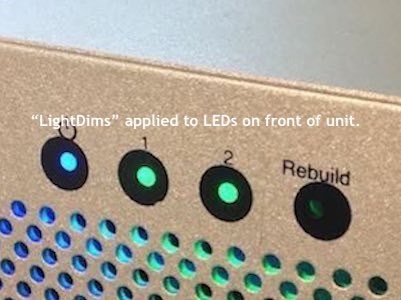 The indicator LEDs on the front of the unit would identify which drive has failed, and then we could simply replace the drive and the mirror would rebuild. For users who don't need RAID, the Mercury Elite Pro Dual also has options to set up a span of the two drives, or use them independently. Originally it was on our server rack, connected to a Mac mini fileserver, but currently it's installed at a desktop workstation. In our opinion, the unit is fast. We have found that, RAID configuration aside, a powered, full-size 3.5" HDD drive on a USB 3.0/3.1 connection typically performs faster than a bus-powered portable 2.5" HDD on a USB 3.0/3.1 connection, and we are quite pleased using it for local storage expansion and backup. The fan is fairly quiet. We don't mind a dull whirring sound because we know the drives are staying well-ventilated. The main source of noise comes from the drives themselves. 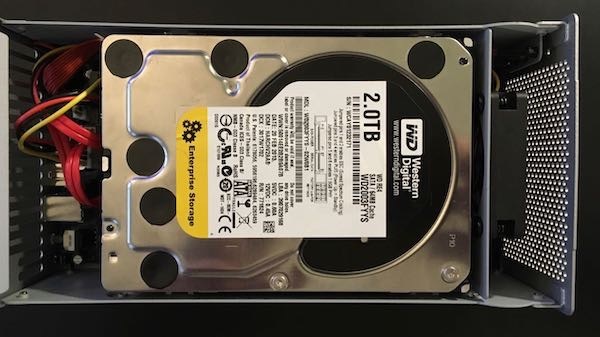 We currently have older-model Western Digital RE drives which should have vibration dampening, but they are LOUD when spinning up and performing read/write operations. While no decibel readings have been taken, we find the hard drive sound level to be somewhere between "noticeable" and "mildly annoying." This is certainly not a fault of the OWC device, and different hard drive model, manufacturer or (surely) SSDs would have different, and we expect, quieter, results. The sound-level issue is merely an observation, not a complaint. 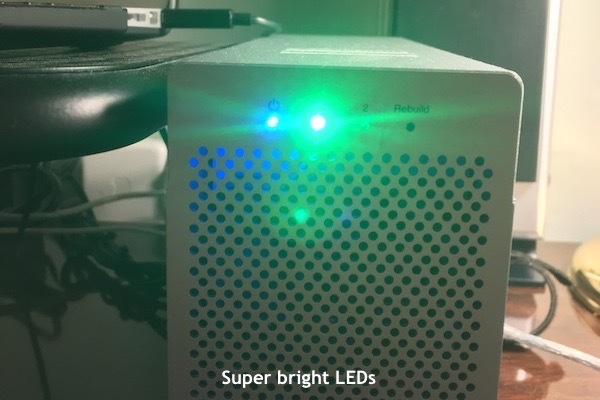 Our only complaint, and this a small one: we find the LEDs on the front to be very bright. Not an issue in the server closet but mildly annoying on the desk. 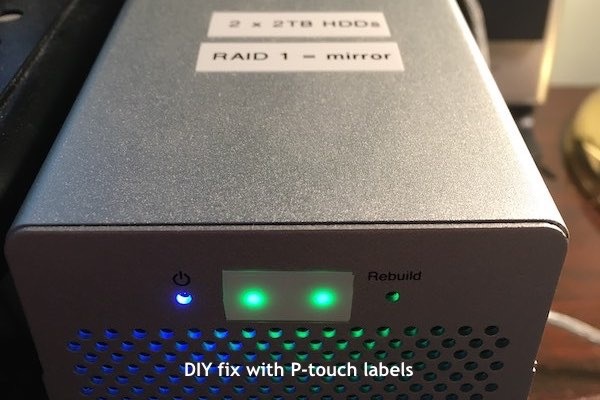 We used two layers of P-Touch Labeler tape over the drive status indicators to tone-down the light. Recently found LED dimmer strips, specifically designed to do this job, available from Amazon. For us, the OWC Mercury Elite Pro Dual Performance RAID Enclosure is a great unit. The add-your-own-drives version is approximately $85, and a great price for an aluminum enclosure with it's configuration options. The OWC Mercury Elite Pro Dual enclosure came with a 1 year warranty and tech support (if we needed it) and both Firewire and USB 3.1 cables. If we had ordered it preconfigured with drives from OWC, it would have had a three-year warranty, which is actually something to consider. The inexpensive OEM drives we ordered from Amazon are claimed to have a 3 or 5 year warranty, depending on the seller, but after reading the reviews, we expect no warranty coverage at all. In retrospect, we should have spent a little more dough and ordered a pre-configured unit. That being said, we've had this RAID enclosure in service for nearly 12 months, with no notable problems. It's fast, reliable, good looking, easy to set up. Just don't stare at the light.